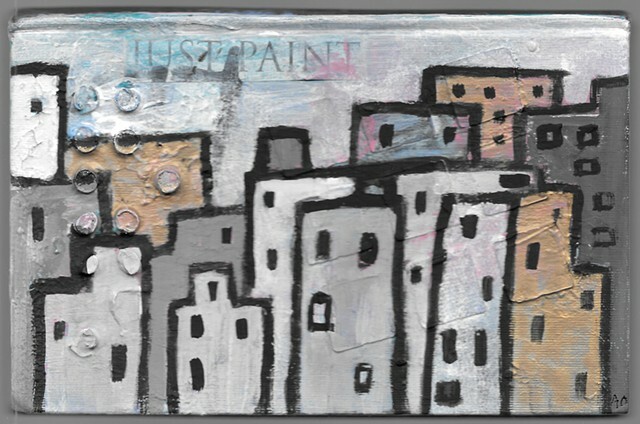 I painted this little cityscape in acrylic on a hardback book. The cover is canvas- why not? It's The Pocket University volume XXI, Part 1, copyright 1922. There are seven stories by authors including Dickens, Zola, Hawthorne and Poe. I wanted the book to remain whole- without pages glued together or drilled into. It hangs by a satin ribbon- just like the integrated bookmarks you find in old, large volumes. You can read a story from a piece of art, and hang it back on your wall.